Get a discount for the ski-lift and ski gear rentals at near shop by staying this hostel! 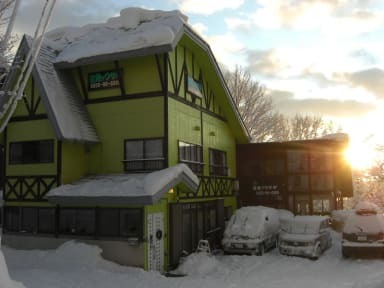 Located in immediate proximity of Myoko-Kogen Suginohara Ski Resort, this Soratobu Usagi (a flying rabbit) offers Japanese-style accommodations, free Wi-Fi in public areas and a shared lounge. Rooms feature Japanese-style with low table, seating cushions and traditional futon bedding. They're fitted with an LCD TV and heating. Bathroom facilities are shared and towels can be rented with additional fee. Facilities at Soratobu Usagi include coin-operated laundry facilities and drink vending machines. Free public parking and luggage storage are also available. Japanese/Western breakfast is served daily in the all-wooden dining room, which features floor-to-ceiling windows for a pleasant start for the day. 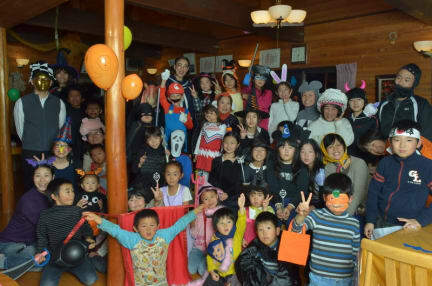 For dinner, Soratobu Usagi offers both Japanese or Western meal. Great accommodation for the whole family. # Ski slope one step away from the entrance # Public bath available 24-hours a day # Sauna # Large drying room # One child under 5 years stays free when using existing beds # There are no capacity for extra beds in the room # Pets are not allowed # Guests without breakfast in their booking must make a reservation by 21:00 previous evening if they wish to eat a breakfast # Guests without dinner in their booking must make a reservation by 10:00 if they wish to eat dinner # Meals included with each plan may change day to day. # No pick-up/drop off service.